By Dr Charlotte Hardman, University of Liverpool, Dr Angela Rowe, University of Bristol, and Dr Laura Wilkinson, Swansea University. The idea of eating a tub of ice cream to cope with being upset has become a bit cliche. Though some might not need a tub of chocolate swirl to help perk themselves up again, there do seem to be systematic differences in the way that people cope with upsetting events, with some more likely to find solace in food than others. This matters because when eating to cope with negative feelings is part of a broader tendency to overeat, it is likely to be associated with obesity and being overweight. More people than ever are now overweight and obese, with recent estimates suggesting that by 2025, 2.7 billion adults worldwide will be affected by obesity, risking health issues such as cardiovascular disease, type 2 diabetes and cancer. So why do some people manage their emotions with food while others don’t? One psychological concept that helps to explain this difference is adult attachment orientation. Depending on the extent to which we fear abandonment by those we love, adults fall somewhere on the dimension of “attachment anxiety”. Where we fall on this dimension (high or low) determines a set of expectations about how we and others behave in personal relationships. These are developed as a response to the care we received as an infant and this can characterise your attachment style. Crying into ice cream might be a stereotype but it shows how we cope with our emotions differently. A recent meta-analysis – a study bringing together the results of many other studies – showed that the higher a person’s attachment anxiety, the more they engage in unhealthy eating behaviours, with a knock-on effect on body mass index (BMI). Two other studies have also shown that patients undergoing weight loss surgery are likely to have higher attachment anxiety scores than a comparable lean population, and it is thought that this difference is partly explained by the tendency to overeat. For a long time, we have known that people who are have high attachment anxiety are more likely to both notice upsetting things and find it harder to manage their emotions when upset. This is because of how attachment orientations come about in the first place. The dynamics and feelings relating to our most important long-term relationships, including in early life, act as a templates that guide our behaviour in subsequent relationships and in stressful situations. If we receive consistent care from a caregiver, which includes helping us to cope with problems in life, we develop a secure attachment orientation. For people high in security, when a negative life event occurs, they are able to seek support from others or soothe themselves by thinking about the sorts of things that their caregiver or other significant person would say to them in that situation. However, inconsistent care – where the caregiver sometimes responds to another’s needs but at other times does not – leads to attachment anxiety and a fear that our needs won’t be met. When negative life events occur, support from others is sought but perceived as unreliable. People with high attachment anxiety are also less able to self-soothe than people with a secure attachment. We recently tested whether this poor emotional management could explain why people with attachment anxiety are more likely to overeat. Importantly, we found that for people high in attachment anxiety it was harder to disengage from whatever was upsetting them and to get on with what they were supposed to be doing. These negative emotions were managed with food and this related to a higher BMI. It is important to note, however, that this is only one factor among many that can influence overeating and BMI. We cannot say that attachment anxiety causes overeating and weight gain. It might be that overeating and weight gain influences our attachment orientation, or it could be a bit of both. There are two approaches that appear promising for attachment anxious individuals seeking to manage their eating behaviour. These involve targeting the specific attachment orientation itself and/or improving emotion regulation skills in general. To target attachment orientation, one possibility is a psychological technique called “security priming” designed to make people behave like “secures”, who cope well with negative life events. It results in beneficial effects more generally, such as engaging in more pro-social behaviours. One study showed that priming is related to snack intake. When people are asked to reflect on secure relationships in their life they eat less in a later snacking episode than when asked to reflect on anxious relationships in their life (though this work is very preliminary and needs replicating and extending). 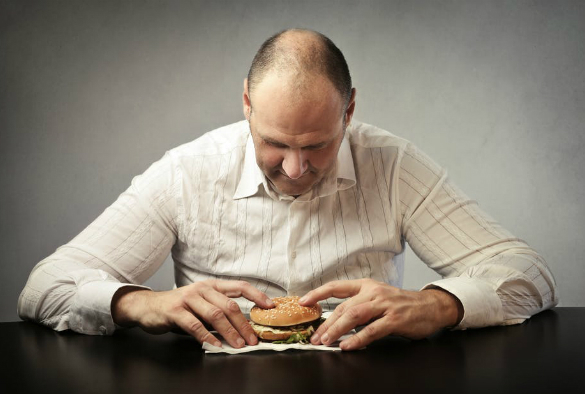 Looking at emotion regulation, a recently published paper highlighted the importance of emotional eaters focusing on skills such as coping with stress rather than calorie restriction, when seeking to lose weight. This study did not look solely at those with attachment anxiety, however, so further work is needed explore this further. Of course, in an ideal world everybody would have relationship experiences that helped them to develop high attachment security, and perhaps this is a hidden third approach – facilitating better caregiving and interpersonal relationships for all.